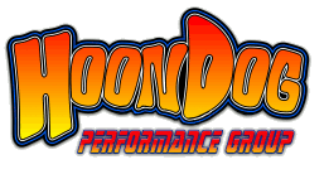 August 21st, 2015 was another historic day for HoonDog Performance Group. For well over a year, HoonDog has been in negotiations with Ford Motor Company relative to safeguarding another piece of automotive history, a 2012 Mustang Boss 302 engineering prototype. Most prototype vehicles are sent to be scrapped once they are beyond their useful life. But for iconic vehicles and/or specific models of high interest to car enthusiasts, this also means that these prototypes are lost forever, never to be seen by the public…automotive history lost forever. For some in Ford the idea of sending some of these prototypes to the crusher is more than disappointing. 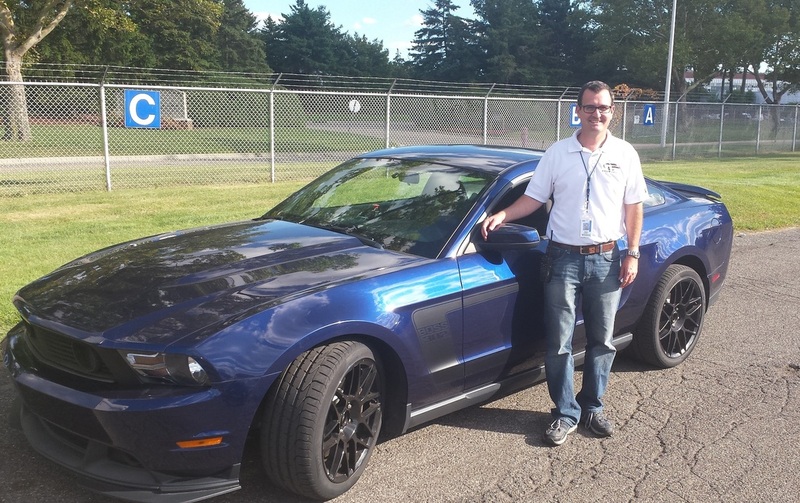 To hear Shawn Carney, Ford Mustang Engineer, talking about such a demise you can hear the motor-head passion he has for these vehicles. Shawn believes there is a great importance in keeping examples of the engineering development vehicles around as compared to having them destroyed. They symbolize a record of the work and effort required of the many Ford engineering teams and supporting staff to bring a new model to market. HoonDog, of course, can only agree! 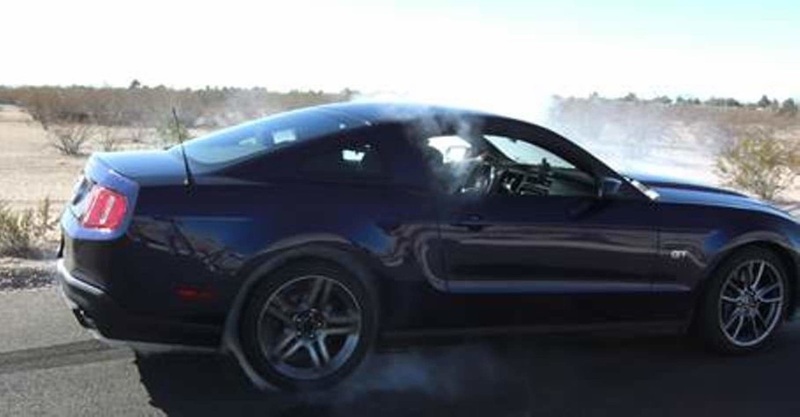 This car was one of a small batch of original Boss 302 prototypes used by the Vehicle Engineering team to develop attributes like NVH (sound and vibration), vehicle dynamics (ride, steering and handling), aerodynamics and heat management. It spent most of its time with the engineering teams in Michigan, with its home base at the Experimental Vehicles Building. Tests were run at both the Dearborn and Romeo tracks, as well as numerous trips to Dearborn engineering labs, dynamometers and the aerodynamic wind tunnel. It also traveled to Arizona, spending a great deal of time at the Arizona Proving Grounds, as well as on-track evaluations at Indes Motorsport Ranch outside of Tucson, and Mid-Ohio. The Boss while running tests in Arizona. The car changed forms as it progressed from early prototype to being the final engineering sign-off vehicle for what would become the base (non-Laguna) Boss 302. The car saw several iterations of powertrain hardware (engines, transmissions, exhaust, induction, drivetrain), cooling systems, calibrations, sound package revisions, chassis setups, etc... on its way to how you see it today. Its original appearance can be seen in Donald Farr's "Mustang - Boss 302" book, and some in-between stages in a Speed Channel documentary. The car is not a true Boss 302 in the production sense as it has a VIN for a 2011 Mustang GT, and is not a part of any serialized Boss 302 build. So with the potential to obtain a Prototype Mustang Boss302, HoonDog immediately began a bid process. As with the '08 Bullitt prototype, the accepted proposal requires HoonDog to regularly make the vehicle available to the public, safeguard and protect this iconic vehicle, and use it as a means of fundraising for the charities supported by our organization. Ultimately, what convinced Ford to dollar-sale the car to HoonDog is our charitable platform. Ford was able to safeguard these vehicles knowing they were in our care. But more importantly they would be made available for the enjoyment of Ford enthusiasts, and in the process they would be supporting various children’s charities. A definite win-win! Automotive history is safeguarded while used for charitable purpose. 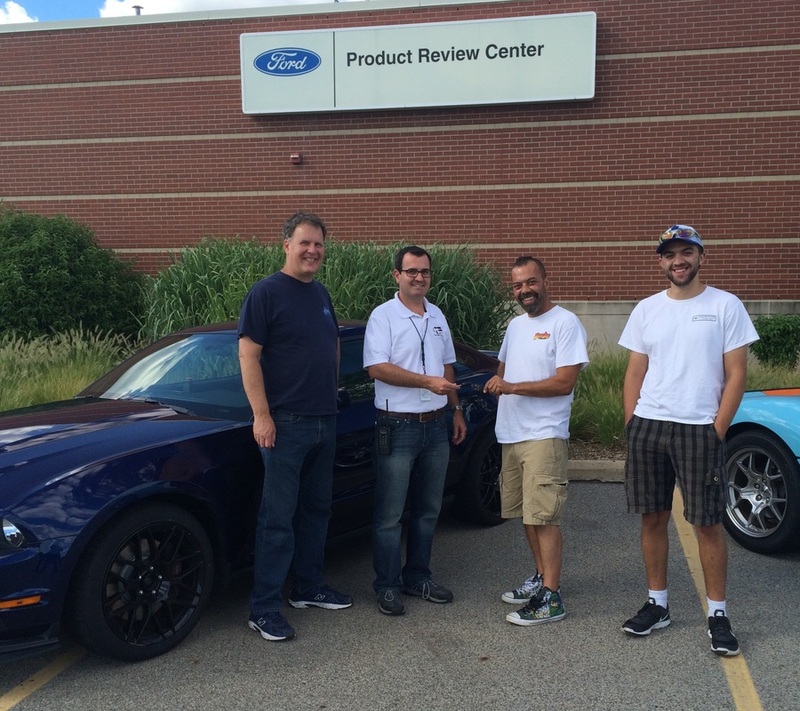 And so it was on Friday August 21, HoonDog Performance Group reps Kurt Andersson and Paul Rocha, along with Paul’s son Dylan, were at the Ford's Dearborn Development Center to take delivery of the 2011 Ford Mustang / Prototype 2012 Boss 302. In addition to Shawn Carney, long time Bullitt supporter and fellow Boss 302 engineer, Nick Terzes, was there to be a part of the event. 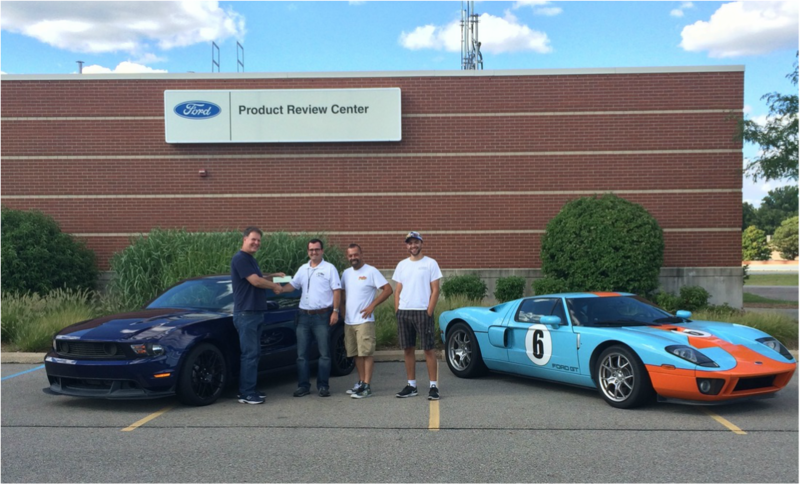 Kurt Andersson is handing the $1 check from HoonDog Performance Group to Ford Motor Company’s Rep Shawn Carney. Shawn (on behalf of Ford Motor Company) handing Paul Rocha the keys to the Boss. The HoonDog team was then given rides in the Boss to show us what she was capable of on the test track. It is simply unbelievable how far Ford continually advances the Mustang. Measured against the 2001 Bullitt, the performance of the Boss is well beyond any possible comparison. It is a driver’s car, and ate up the track with incredible power, skill and agility. For us, the ride in the Boss would have been the singular highlight of the day, but to coin a classic slogan, ‘Ford had a better idea’. There, waiting for us alongside the Boss, was a Ford GT! With Nick Terzes at the wheel, and under the constant eye of the track control tower, we then had the rare opportunity to hit the track as a passenger in the Ford GT. The experience can only be described as being strapped in a raw rocket sled on rails spewing exhaust, brake fumes, burned up rubber and the whine of singing gears in its wake! For a group of gearheads, we were simply in a state of Nirvana, and can only thank Ford Motor Company, and their engineers Shawn and Nick, for providing HoonDog with such an incredible experience as we took delivery of the Boss Prototype. HoonDog Performance Group is very proud to announce that our unique partnership with Ford Motor Company has made history once again by being entrusted by Ford to care for such a special, one of a kind vehicle as the 2012 Mustang Boss 302 Prototype. Shawn Carney standing next to the Boss one last time.